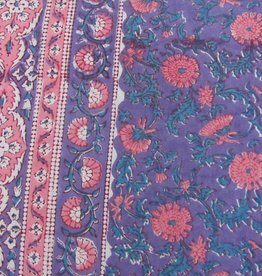 Beautiful double counterpane, ajrak blockprint and handstitched in Rajesthan in de traditional Gudri work that was originally used to make layers of old saris into bed covers for the cold winter nights. 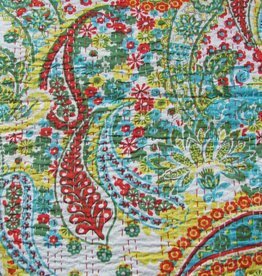 Bohemian happy hippy cotton cushion cover 60 x 60cm. "bird of Paradise" design. Silkscreen printed and embroidered with the Rajasthani technique of sewing more layers of materials together called Gudri. Backside pure cotten with a zipper closing.